The illustrated Victorinox Knife is the Victorinox Fieldmaster Knife with Red handle. The components of this Swiss Army Knife include a large blade, small blade, can opener with small screwdriver (also for Phillips screws), bottle opener with large screwdriver and wire stripper, wood saw, scissors, reamer with sewing eye, Phillips screwdriver, multi-purpose hook (parcel carrier), toothpick, tweezers and key ring. 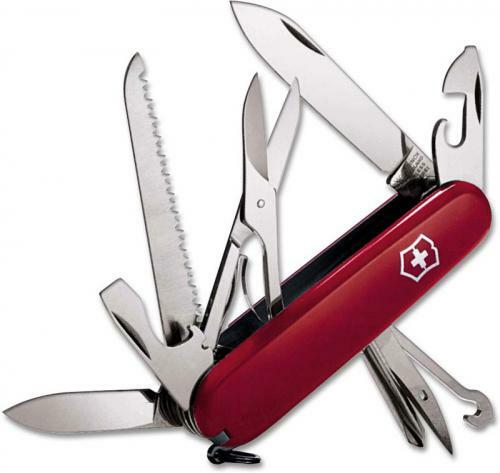 The Victorinox Fieldmaster Knife with Red handle has a closed length of 3 1/2". For this category of knives, this one has about all the basic tools you would need at a price that is below what I expected. The brand is top shelf too. And if one bought a small bag of tools or a large bag, there will always be one you didn't bring. This is a good compromise on size, price, and function. I am a knife collector and own many knives. Victorinox has by far the sharpest edges. Quality fit and finish as well. The steel resist corrosion better than any expensive blades.